When you work with Cedar Ridge Real Estate, you’re signing up for premier service from some of the White Mountain area’s most accomplished professionals. We’ll always answer the phone or promptly return your call. Our team will make sure you understand every element of the buying or selling process, working on a custom timeline so you know what to expect and when to expect it. 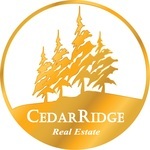 Simply put, Cedar Ridge represents the best our industry has to offer. Marce helped us find a house that was perfect for our little family. I got soooooooooo excited about the house! Thank you is not enough. We appreciate you. From farm land, mountain property, cabins, homes or building new.... Cedar Ridge is your Realtor for the AZ White Mountains. Review Stream Powered by OMG National | © Copyright 2019. Show Low Real Estate - Marce Wildman. All Rights Reserved.